New Zealand’s coalition Government has set out to burnish its clean, green image by becoming Asia Pacific’s first developed economy to stop using fossil fuels to generate power, though the pitfalls encountered by a Maori iwi, or tribe, may signal trouble ahead. The international wire service Reuters excamined the NZ energy scene and said the 3,000-member Ngaati Kea Ngaati Tuara iwi in Rotorua, when switching to renewables, found local geothermal sources were not hot enough to generate electricity. So, the tribe set up small hydro units for its meeting ground and dairy farm, but the units struggle to operate during floods and to produce enough power at peak demand, according to project manager Eugene Berryman-Kamp. A battery could store energy for periods of high use, but there is currently “no appetite” to invest the more than $10,000 needed, he said. “If we move too quickly, the risk is to the New Zealand consumer having to pay more for their energy and (this) could make New Zealand less competitive as a market,” said Marc England, chief executive of New Zealand’s biggest energy retailer and fourth-biggest generator, Genesis Energy Ltd (NZX & ASXL GNE). New Zealand would need large batteries, extra wind and solar power, and might still need to use gas or coal to prevent blackouts. (NZ Resources has often cited the important back-up role the Huntly gas and coal-fired power station plays when hydro storage is low, or storms and windless periods play on the capacity of wind power). Reuters said Such investments would send costs soaring and could alienate voters who elected Prime Minister Jacinda Ardern last year, in part due to her pledge to counter climate change. (despite alarmist claims by Greenpeace and Ardern, NZ’s climate change issues are minimal-Editor). The wire service said critics say Ardern’s goals would require huge investments in renewable energy sources, grid expansion, and an overhaul of NZ’s biggest export industry, dairy, which relies heavily on coal, driving up power prices. Sapere Research Group advised Wellington its goals would require wholesale electricity prices to rise by up to 60% to around NZ$100 per megawatt-hour (MWh), making them some of the highest in the world. 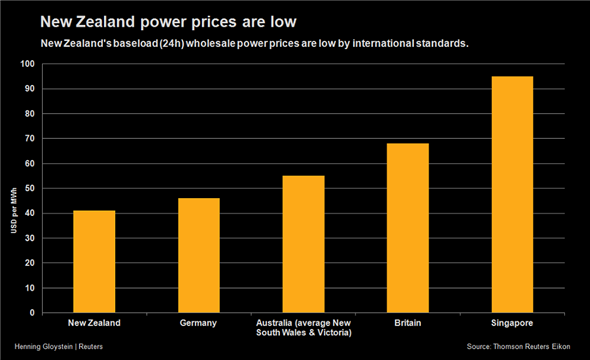 That would destroy a key advantage for agriculture and industry in NZ, where baseload power futures are currently running about 25% less than in Australian states New South Wales and Victoria, where soaring electricity costs have forced some manufacturers to shut. A backlash from industry and politicians has deepened partisan fault lines that Ardern’s centre-left Government, installed in October, is trying so smooth over. But the criticism has not stopped her from looking to establish a legacy by combating climate change. Climate Change Minister and Green Party Leader James Shaw has set up a panel to develop a carbon neutrality plan by mid-2019, and a public and business consultation is scheduled for June. “We need to be looking at - more renewable generation and potentially storage to replace our aging fossil fuel generators, as well as energy efficiency initiatives to better manage demand,” Shaw told Reuters. New Zealand gets more than 80% of its energy from renewables, mostly hydropower. Another 14% comes from natural gas and 3% from coal. Fonterra Co-operative Group (NZX: FCG), the world’s top dairy exporter and one of NZ’s biggest energy users, gets around two-thirds of its power from fossil fuels. Fonterra is trying to ditch coal, but a change is going to “require significant investment,” said chief operating officer Robert Spurway. Part of the problem is that while most of the population and industry is on the North Island, most of the hydro stations are on the South Island. That increases the outage risk because of the possibility of damage to cables. Many analysts still say NZ’s plan to go green is viable and will benefit the country, though England said switching to electric vehicles (EV) to wean transport off petrol would be better than 100% renewable power generation. Source: reuters.com Reporting by Charlotte Greenfield in Wellington and Sonali Paul in Melbourne. Current power cost variations. Source Reuters. 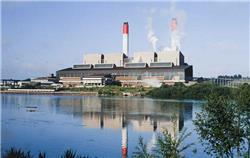 Huntly power station: Photo McMahon Electrical.